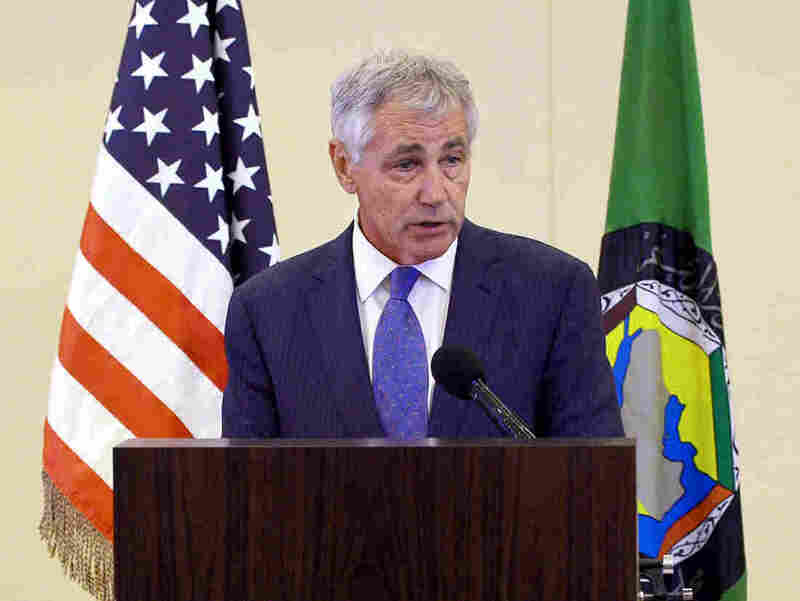 Hagel: U.S. Drones Searching For Kidnapped Nigerian Schoolgirls : The Two-Way The defense secretary confirmed that unmanned reconnaissance aircraft were being used to look for 270 girls abducted by Islamic militants last month. Defense Secretary Chuck Hagel speaks during a news conference after attending the Gulf Cooperation Council meeting in Jiddah, Saudi Arabia, on Wednesday. Hagel confirmed that the U.S. was using drones to search for 270 kidnapped Nigerian schoolgirls. Secretary of Defense Chuck Hagel said Wednesday that the U.S. is using surveillance drones to try to locate more than 270 kidnapped schoolgirls in Nigeria. "We are now providing unmanned reconnaissance intelligence over Nigeria and we'll continue to do that," Hagel told reporters in Saudi Arabia at a meeting of the Gulf Cooperation Council. The Wall Street Journal reports: "The American drones will be flying over Nigeria along with a piloted U.S. reconnaissance plane as part of an effort that also includes more than two dozen specialists sent by Washington to aid the Nigerian government in the search." Meanwhile, Nigeria's President Goodluck Jonathan has reportedly rejected a possible swap of Islamic militants for the return of the girls, who were abducted on April 15 by Boko Haram militants in the northeastern town of Chibok. Jonathan has "made it very clear that there will be no negotiation with Boko Haram that involves a swap of abducted schoolgirls for prisoners," Mark Simmonds, British Foreign Office minister, told journalists in the Nigerian capital, Abuja, according to The Associated Press. "The point that also was made very clear to me is that the president was keen to continue and facilitate ongoing dialogue to find a structure and architecture of delivering lasting solution to the conflict and the cause of conflict in northern Nigeria," Simmonds said.